During her 8-week residency at the Piscator Press, Wendy truly brought our Level 1 print workshop back to life. Using letterpress and digital printing processes, Wendy produced an edition of 80 copies of Sydney - we need to talk, a collection of short, accessible explorations of the politics of urbanisation. Authored by a multi-disciplinary team of University of Sydney scholars, the book was launched as part of the 5th Festival of Urbanism in September 2018. 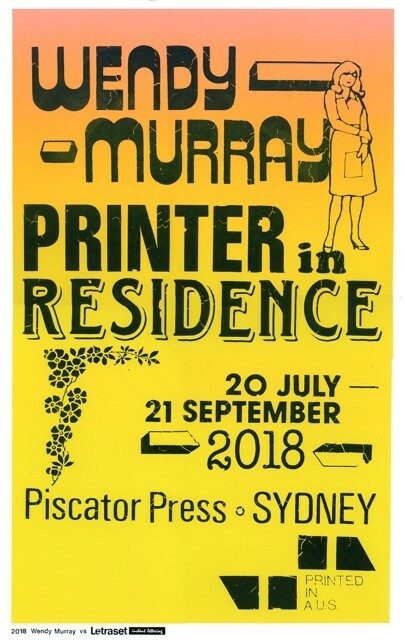 As well as using the Library's Albion presses and type collections, Wendy's design drew upon the historic publications of the Piscator Press that are now held in Rare Books & Special Collections. Of this project, Wendy writes 'This illustrated book is an experiment with collaborative short-form writing. Each co-authored piece involves a dialogue between people and places. Sydney is the central character in each essay, as each author is Sydney based - we draw from our research and experiences in our city. And, each essay goes somewhere else: Sydney meets another city'. Find out more about Wendy's residency on her website and Instagram. A display of historic materials from the Piscator Press, alongside work by Wendy Murray, our 2018 Printer in Residence.